Manufacturer of a wide range of products which include sub sonic wind tunnel, two phase flow, tilting flume, thermal dispersion setup, open jet wind tunnel and tidal wave flume. The inclined-tube manometer is used to indicate the current air speed at the entrance to the measurement section. 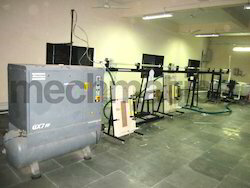 The wind tunnel is installed on a laboratory trolley that is easy to move. The trolley is provided with shelves and lockable drawers for storing measuring instruments, models and other materials. Two phase flow occurs in a system containing gas and liquid with a meniscus separating the two phases. 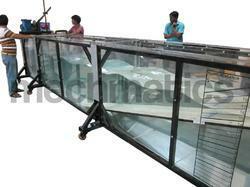 The tilting flume is designed to conduct various experiments at various bed slopes from in upstream and down stream. 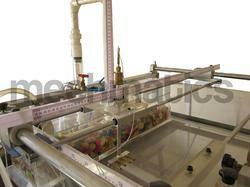 The flume has a perspex window to visualize the flow over models fixed in flume. The flume is provided with gates on upstream & downstream side to control the flow. Students can thus conduct the experiments and also visualize the flow. 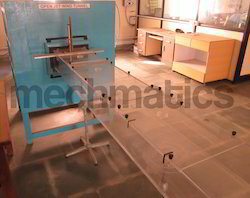 Various experiments like open channel flow study, specific energy curve, hydraulic jump, calibration of weirs, notches and venturi flume can be conducted. Provided with sliding gates, One at upstream and one at downstream side & flow settling chamber at inlet. Screw Jack at down stream side to change slope of bed. Completely Transparent window for Visualization of flow. 600 V notch with flume fitting fixture. Sharp crested weir - 1 no. Broad crested weir - 1 no. Ogee weir - 1 no. Trolley mounted point gauge for level measurement of water. Trolley can be traversed for whole length of flume. Orfice meter & differential manometer for measurement of flow or Suitable size Rotameter. 2 HP pump and sump tank for recirculating the water. A detailed technical manual accompanies the unit. Crump Weir; Culvert; Radial Gate; Parshall Flume; Plain Beach; Wave generator; Artificially Roughened Bed; Siphon Weir; Tradepaziodal Flume; Velocity meter; Energy Dissipation; Digital Level Gauge; Piers; Rake and many more.